LUX LED Lights by Mighty Bright, designer and manufacturer of innovative LED lighting products, will unveil two new products in the LUX Brooklyn lighting for hospitality line at HD Expo 2016. Designed to gracefully complement hospitality interiors, the LUX Brooklyn LED Desk Lamp and LUX Brooklyn LED Floor Lamp will be exhibited in booth 4121 at the ultimate trade show for the hospitality industry, taking place at the Mandalay Bay in Las Vegas, NV. The full Brooklyn line can also be seen at http://www.lux-led-lights.com. The newest additions maintain the LUX Brooklyn hospitality lighting line’s clean, modern aesthetic while broadening the collection’s appeal with chic, tailored linen shades. Casting warm white, ambient light, the Brooklyn Desk and Floor lamps illuminate both guest rooms and common areas with a soft, welcoming glow. The LUX Brooklyn LED Desk Lamp possesses the same utilitarian features that have contributed to the Brooklyn AC LED Task Light’s immense success: two universal AC sockets and two USB ports. Designed to charge and power multiple devices simultaneously, the LUX Brooklyn LED Desk Lamp is indispensable for today’s modern international traveler. The energy-efficient lamp uses long-lasting LEDs to cast 1000 lumens of warm white, 3000K light. Touch activated with three brightness levels, the Brooklyn LED Desk Lamp also features a wide, weighted base for extra stability. Its sandblasted aluminum frame subtly enhances contemporary spaces, and its durable device holder supports a wide variety of electronics and acts as a cord sleeve while charging. 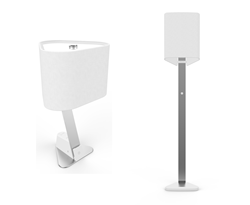 The LUX Brooklyn LED Floor Lamp is the first and only floor lamp in the collection. Also constructed of sandblasted aluminum, the Brooklyn Floor Lamp has three brightness levels and casts up to 1200 lumens of warm white, eco-friendly LED light. Its weighted base supports its slender frame, enabling it to gracefully brighten rooms with refined elegance. Visit booth #4121 to see the complete line of LUX LED Lights by Mighty Bright. LUX LED Lights by Mighty Bright is the contemporary solution for task lighting. Utility and design are paramount for LUX LED Lights — fit a LUX Light into any space for an exquisite focal point or to brighten a dark corner. High performing LUX LED task lights reduce energy usage while enhancing spaces with exceptional style. Streamlined and sophisticated, LUX LED Lights are functional, eco-friendly and embody a simple aesthetic elegance, compromising neither form nor function.